International News Media Association World Congress, Editor's Retreat. "Metrics to magnify your journalism," Washington, DC. (June 2018). Photo by Jenny Paurys. Metrics for News: I work on the Metrics for News team. We are charged with helping newsrooms develop data-informed content strategies that grow audiences and deepen engagement. 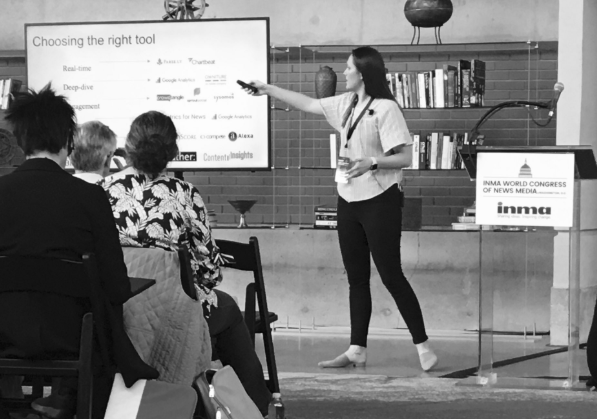 As partner development manager, I empower prospective and newly-signed partners to understand how MFN’s suite of products can help them build a loyal and engaged audience over time. To do that, we use our proprietary Metrics for News software to track content using blended metrics. We next administer audience surveys that assess respondents’ most profound worries and passions. Then we use findings from the content tagging analysis and survey to help newsrooms identify and improve core coverage areas. We deliver solutions through consultation and written strategy memos for newsroom leaders. Training/speaking: I spend my time educating newsrooms on metrics basics and all aspects of the Metrics for News process. I have presented at conferences, summits and training programs on metrics/analytics and news literacy. Miscellaneous: In addition to the above, I assist with planning and executing Thought Leader summit events. Occasionally write or edit API’s Need to Know morning newsletter, which curates practical insights and ideas from all over the world of media and tech. I served as interim lead writer for two months in the spring of 2018. I've also worked on API’s news literacy program, where I’ve helped transition our focus from solely youth news literacy to news organizations’ critical role in helping the public better understand journalism and news media processes. I also participate in research design related to news literacy (and occasionally other topics).